The Studio Designs LED Swing Arm Lamp pairs a classic design with the modern benefits of an LED lighting system. Replacing a standard CFL bulb, the eco-friendly LED consumes less energy, produces little to no heat, and lasts longer — 10,000 hours on average. The lamp’s flexible arm extends to 36" and its springs and tension control knobs are made of steel for extra durability. A sturdy clamp attaches easily to almost any table. The LED emits 422 lumens, and its color temperature is 4,000K. It uses 8 watts of energy. 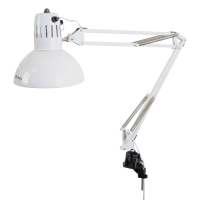 The Studio Designs LED Swing Arm Lamp measures 39" W × 6½" D × 7" H and is backed by a 10-year manufacturer’s warranty. Some assembly is required. The Studio Designs LED Swing Arm Lamp pairs a classic design with the modern benefits of an LED lighting system. LED lights consume less energy, produce little to no heat, and last longer — 10,000 hours on average. 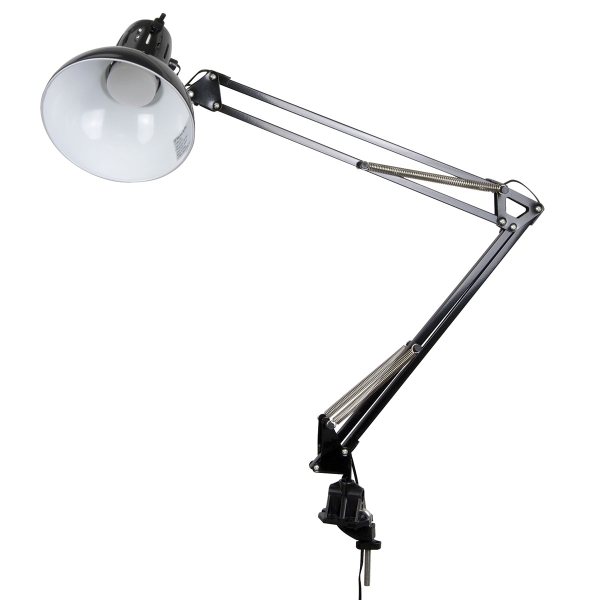 The lamp’s flexible arm extends to 36" and its springs and tension control knobs are made of steel for extra durability.